Just where the heck is 4 Guys, anyway? If that's what you're asking right now, here's your answer. 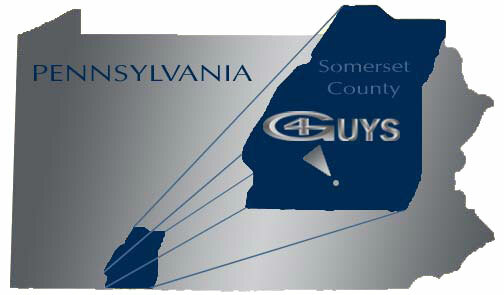 4 Guys is located in Meyersdale, Pennsylvania. Meyersdale is in Somerset County, in an area known as the Laurel Highlands. Great Allegheny Passage The former Western Maryland Railroad is now a bike trail conecting Pittsburgh with Washington, D.C.
Mt. Davis - At 3213 ft Above Sea Level, it's Pennsylvania's Highest Point. Flight 93 Memorial - A memorial to heroes of September 11, 2001. Quecreek Mine Rescue - Scene of the famous "9 for 9" Mine Rescue. PA Maple Festival - Held in Meyersdale every spring since 1948. Check out their web site. If your're in the neighborhood, stop in and we'll give you a tour of our plant!